There are a variety of things to see and do in Georgetown, Washington, D.C.'s most historic neighborhood. Lined with cobblestone streets and 18th and 19th-century architecture, the waterfront town was first established in 1751 and remains as one of the city’s most treasured neighborhoods blending the old and new. Throughout history, Georgetown has served as home to a long list of famous residents including Thomas Jefferson, Francis Scott Key, John F. Kennedy, Herman Wouk, and Elizabeth Taylor. Today, it is a popular area to visit for both locals and tourists. Georgetown is most known for its shopping, dining, and nightlife. But the area has a fascinating history. 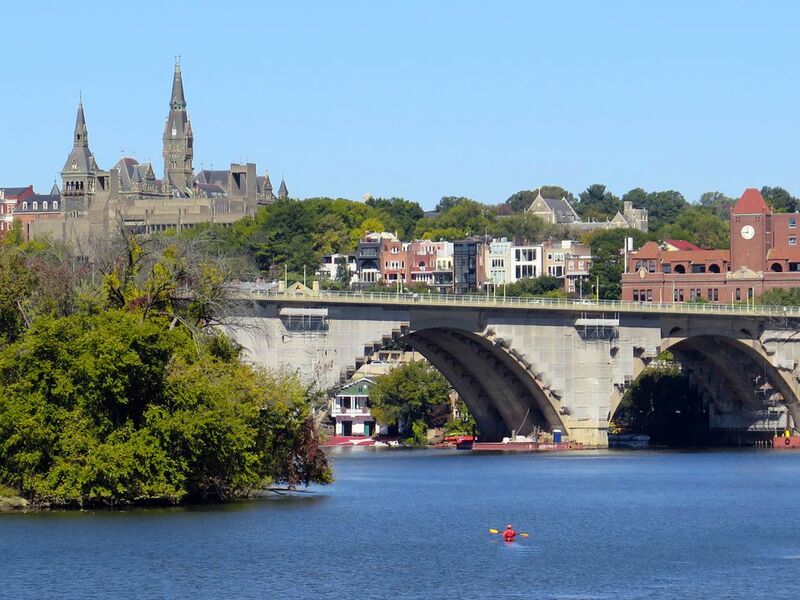 Take a tour of Georgetown, learn about the neighborhood's history and see 18th and 19th-century homes, the C & O Canal, the prestigious Georgetown University, and more. For a basic tour, Washington Walks offers a two-hour walking tour of Georgetown. The Gastronomic Georgetown Food Tour is a three-hour food tour that highlights the cuisine of locally owned and operated restaurants and shops in historic Georgetown. Try some favorite presidential dishes, handcrafted European beverages, high-end Turkish inspired cuisine, desserts from Georgetown's favorite family-run bakery and much more. As you take a walk along the historic Chesapeake and Ohio Canal, stop by the Georgetown Visitor Center and learn about the history of commerce and transportation in Washington, D.C. Park rangers will transport you back in time to the 1870s and tell you about the lock system and life during the early years of the capital city. The C & O Canal is a national historic park that runs 184.5 miles along the north bank of the Potomac River, starting in Georgetown and ending in Cumberland, Maryland. Georgetown is known as one of D.C.’s best destinations for dining and nightlife. Restaurants range from fine dining to casual eateries serving cuisine from all over the world. For a romantic meal in an exceptional setting, try 1789 Restaurant, a historic restaurant on a quiet Georgetown street, or try Farmers, Fishers, Bakers, a waterfront restaurant with a focus on sustainability. During the warmer months of the year, restaurants on the Georgetown Waterfront are trendy and offer outdoor seating with great views of the Potomac River. You’ll find everything from singles hotspots to romantic wine bars to lively collegiate gathering places. Georgetown is a popular D.C. neighborhood for shopping, dining, and nightlife. This shopping mecca appeals to the younger crowd but also has plenty of boutiques and antique stores for all ages. Most of the shops in Georgetown are centered along M Street and Wisconsin Avenue and range from upscale clothing boutiques like Ann Mashburn to fun and trendy home and garden shops American/holiday. If you're in town on a Sunday, don't miss the acclaimed flea market. Georgetown is one of the oldest neighborhoods in DC and has many interesting historic homes. A few of them are museums open to the public for tours, including the Old Stone House, built in 1765 and the oldest known private residence in Washington, D.C., Dumbarton House, owned by The National Society of the Colonial Dames of America, and Tudor Place Historic House and Garden, a National Historic Landmark that was originally owned by Martha Custis Peter, the granddaughter of Martha Washington. Georgetown waterfront area has been recently redeveloped with the addition of Georgetown Waterfront Park, a peaceful place to relax and enjoy the shade, flowering trees, and a view of the Potomac River. The walking paths are a beautiful place to take a stroll, while many of the restaurants on the Georgetown waterfront are favorite places to enjoy dining outdoors during the summer months. Capitol River Cruises offers a 45-minute historical narrative sightseeing tour of Washington, D.C., aboard their two small riverboats, the Nightingale and Nightingale II. This is a fun and family-friendly way to see the spectacular views of Washington, DC from the Potomac River. On your quick trip, you'll see the Kennedy Center, the Washington Monument, the Jefferson Memorial, the U.S. Capitol, and the Lincoln Memorial. The Capital Crescent Trail is a beautiful 13-mile bike trail that begins in Georgetown and extends to Silver Spring, Maryland. Bike rentals are available through several vendors around the Washington, D.C., area. With 40 miles of bike lanes and more than 800 miles of biking trails in the region, it's not surprising that cycling has grown more and more popular in D.C. recently. The Ice Rink at Washington Harbour, located on the Georgetown waterfront, is 11,800 square feet and is the largest outdoor rink in the D.C. area. The skating season is November through February. Skating lessons are available, and the rink can accommodate parties and special events.